Imagine Britain, and most people conjure up image of queuing, a stiff upper lip and some madcap traditions which have somehow, strangely, existed into the technological twenty-first century. Let's take a look at some our best and less well-known eccentric traditions. One of the staple best known British traditions is when a group of people, usually men, dress in white (or a white shirt at least), with crossed baldrics, rosettes or ribbons, with pads of bells strapped to their shins, they wave white handkerchiefs and clash short sticks. They are usually accompanied by a Fool who has a bladder on the end of a stick or a hobby horse. 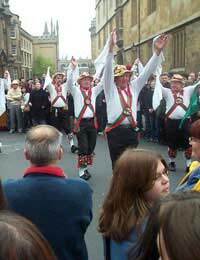 More contemporary morris dancers dress in black or other colours and sometimes perform to music, gleefully shouting as they clash sticks. The post-war folk revival led to the resurgence of morris dancing in the 1960s and there are reported to be several hundred clubs still in existence. One ‘alternative’ version of morris dancing is Britannia Coconut Dancers. On Easter Saturday, whatever the weather, the male dancers tour the streets of Bacup, Lancashire, following a tradition of folk dancing. But what makes them unique is their blackened faces and mainly black outfits and the traditional coconuts (or wooden disks) strapped to their hands, knees and belt. What began as a bar room conversation in a mid-Wales pub started in earnest in 1975 and now boasts an annual World Championship, held every bank holiday in August, at the Waen Rhydd peat bog, close to Llanwrtyd Wells. In the shortest possible time, competitors have to complete two consecutive lengths of a 55 metre/60 yard trench filled with muddy water, which has been cut through a peat bog. The competitors are kitted out in snorkels and flippers and must complete the course without using any conventional swimming strokes. Now in its third year, the annual World Gravy Wrestling Championships are held in Stacksteads, Lancashire, using, in 2009, 2,000 litres of gravy. Over 100 spectators watched opponents grapple with each other in one of the wackiest events which make up the Pennine Lancashire Festival of Food and Culture. One of the most bizarre – and yet quintessentially English – traditions is the sport of cheese rolling. Unlike in Randwick, Gloucestershire, where three large cheeses are decorated, carried through the village, rolled three times round the church, before being carried back through the village, cut up and distributed, the events at Coopers Hill aren’t as generous. Here participants chase a large, round Gloucestershire cheese which is rolled down the hill. With little chance of catching it, the winner is the first one to the bottom of the hill. For one day each May, the Cornish town of Helston is decorated with bunting, greenery and blossoms and people wear buttons holes as they line the streets in their thousands. Left in the middle is a narrow passage for the dancers to make their way through to the music of the town’s silver band in one of the four dances of the day. The most famous dance, the Principal Dance, includes men wearing top hat and tails and women wearing brightly coloured dresses and wide-brimmed summer hats. The final dance of the day is a virtual free-for-all. Each dance takes its own route through the town and can take over an hour to complete. The Birdman is a flight competition for human-powered 'flying machines' held annually during the summer in the British seaside resort of Bognor Regis. The competition has become an opportunity for people of all ages to dress up in fancy dress or homemade, wacky costumes and leap from the end of Bognor Pier in the name of humour and, more often, charity. According to the Birdman website, some of the more adventurous entries of past years include the pope, a flying squirrel and Donald Duck (all 1984), a 10 metre Concorde, penguins and Ninja Turtles (all 1990), a surreal giant bug, complete with four training shoes to absorb its impact with the English Channel (2001) and a skateboarding cow (2004). The Headington Shark in Oxford rates as one of the most unusual tourist attractions in the UK. Imagine a fibreglass shark which is 25 feet long and weighs four hundred weigh, sticking out of the roof of your house to commemorate the 41st anniversary of the dropping of the atomic bomb on Nagasaki. That’s exactly what it is - making Stonehenge appear comparatively 'normal'. But is there anything normal about paying to see a circle of ancient big stones? Travel to Wiltshire and judge for yourself. The 208-tonne Angel of the North is the giant form of a human figure. At 20 metres high, the Angel is higher than a five-storey building. Its wings are 54 metres wide - almost the same as a jumbo jet – and it’s just what tourists want to see when they reach Gateshead in north-east England. Whilst some might assume that Paddington Station in London might be a tourist attraction because of the link with Paddington Bear, it's actually the architecture of its famous roof that draws the crowds. Made up of three spans of wrought iron arches with two transepts connecting them, it is a work of architectural and industrial art. Whilst in London, you might also want to visit the old operating theatre at Guy’s Hospital to see the table where the infamous amputations took place. The Giant's Causeway is a World Heritage Site in Northern Ireland. The area consists of about 40,000 interlocking basalt columns, created after a volcanic eruption. Although naturally formed, each column looks as though it has been hand-crafted by mythical masons. 'Giant's Causeway' takes its name from the legend of mythical Irish giant by the name of Finn MacCool. The legend says that he built the causeway to make his way to Scotland where he would battle with a rival giant called Benandonner. And taking us to Scotland, we mustn’t forget Loch Ness where people go to look for the mythical Loch Ness Monster. Whilst there’s much controversy surrounding the existence of any conclusive proof that a monster exists, it seems to positively encourage thousands of visitors each year, a thriving tourist trade and a worldwide reputation for this natural beauty spot. Tring Natural History Museum in Hertfordshire contains thousands of species lovingly restored for the public gaze. Taxidermy at its best has preserved historical features of animals from domestic dogs, primates, birds, crocodiles, rhinoceroses, bison and stuffed bodies and skeletons of virtually every animal you can think of. Recent attractions in Lancashire include The Singing Ringing Tree (a tree-like structure of tubular bells which “sings” as wind blows through it) and The Halo (an early green, glowing spacecraft-like object on top of a hill); and they must match the superlambananas which sprung up around Liverpool during the year of the European Capital of Culture. And not forgetting Milton Keynes’ own concrete cows and the 100 iron-cast figures on Crosby Beach, Merseyside. So far from thinking Britain is full of reserved, level-headed people, bear in mind that behind that formality lies a wealth of unusual tourist attractions and traditions which has made Britain the unique place history has led it to.